Another interesting but not amazing album on the list, the last in a sequence of three. 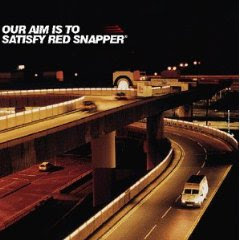 Red Snapper is a kind of Jazzy Electronica which never really took off and seems to have by now died down somewhat. The album bears affinities not only to Jazz but to R&B and club music generally. It is, however, a quite dark and brooding album with some erotica thrown into the mix. In fact the last three albums all kind of blend into each other. This happens because even if Common and Red Snapper are completely different, Mike Ladd in the middle there creates the bridge. Common's is a hip-hop album, Ladd's a hip-hop/dark electronica album and Red Snapper goes further into the dark electronica, making this an interesting experience. So it is only fair that it gets exactly the same grade as the previous two. Red Snapper are a British instrumental band founded in London in 1993 by Ali Friend (double bass), Richard Thair (drums), and David Ayers (guitar). The three core members are also joined by various guest musicians and vocalists on different records. According to music journalist, Jason Ankeny (Allmusic) "the British acid jazz trio were notable for their pioneering synthesis of acoustic instruments and electronic textures".